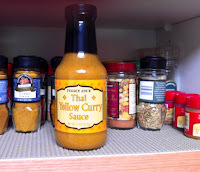 I am a huge fan of yellow curry chicken, in fact. it's probably the only thing I order at Thai restaurants. I found yellow curry sauce at Trader Joe's, used it by itself once, and wasn't a fan; however, it's pretty fantastic with a bit of flare.